It's time for the Annual Extraterrestrial Cow-Pulling Contest, and aliens from all over the galaxy have come to watch the event! Go head to head with your cross-cosmos rival to see who can abduct three Cosmic Cows first! The number combinations that are rolled determine the movement of the cows, and each player can choose which tractor beam to use in order to abduct them. With a good mix of strategic offensive and defensive maneuvers, decide which combination of the unknowing bovines to pull toward your spaceship or away from your opponent's! The player that pulls three cows into their Win Zone first is the winner in this dicey game of alien tug-of-war! 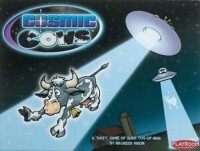 Cosmic Cows is a Yahtzee-style game that I have found plays quite well with young kids. I’ve played it with my daughter when she was six and she played pretty well. You are playing aliens in a cow-pulling contest in what I have to assume is the alien version of red-neck games. There are nine rows with one cow in each row. Each turn you roll six dice five dice and choose which ones to keep, then re-roll the others up to two more times. For each 1 you keep, you move the cow in row one toward you one space, but you need at least one pair for this to happen. For example, if you roll four 5’s you move the cow in row five four spaces. Plus there is a row for large and small straights, a chance row for adding all the numbers up to a very small number or very large number, and a five of a kind row. One five of a kind moves the cow all the way across the board. Once you have three cows into one of your last three red win spaces, you win! A good game to play with one kid, and easier for them to wrap their head around than Yahtzee. Check out my house rule in the tips section for a faster game. Add a Review for "Cosmic Cows"